Let Top Notch Mobile Home Services based in Fort Worth, Texas and now with a branch in Florida protect your home from the damage caused by broken panels. We offer restorative mobile and manufactured home skirting solutions to maintain curb appeal of your home. Prevent mold, corrosion and rodent intrusion from infesting your home. This service offers the needed solutions to repair cracked or broken panels, as well as erroneously installed skirting boards. We offer vinyl skirting that comes with white or beige color options. We also provide long-lasting rock skirting, which is easy to clean. -Wood plank. Other material types can be used at the clients' request. We offer mobile and manufactured home underpinning options for the best repair with our all-inclusive service. If you need concrete underpinning for manufactured homes in the Fort Worth, TX area look no further. Replacing the underbelly along with insulation will help lower your heating and cooling costs. No matter the size of the job, we can handle it for you. We also get rid of the faulty insulation so you don't have to. There are multiple types of manufactured home siding that can be installed. Vinyl siding is one of the most common with manufactured homes. We offer Dutch lap vinyl siding as one of the premium installs. We include removal and haul off with all of our installs. At 3.50 we are highly competitive with pricing as we want your business. Smart manufactured home siding is another commonly used siding for manufactured homes. 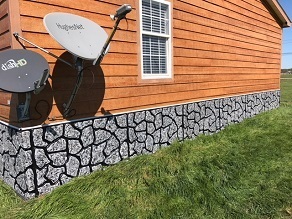 Whether it’s a complete siding install or a simple siding patch, we can get the job done right for you. Pricing varies depending on square footage. Call us today for a free estimate. Skirting installation will only one to three days. Our skirting installation service comes with a five-year warranty. Contact us for our results-driven mobile home skirting solutions.